Step 1: Buy some diapers! If you can, choose something with bold colors or a cute all over design. Seeing as this was my first attempt at a diaper cake, I didn’t realize what I was getting myself into with this many diapers! But they were tiny and suuper cute. My tip to you now that I have a little bit of experience: Buy less, bigger diapers. This way you can have a good sized cake with way less effort! Step 2: Grab a diaper and start rolling! Start rolling it from the top of the diaper. 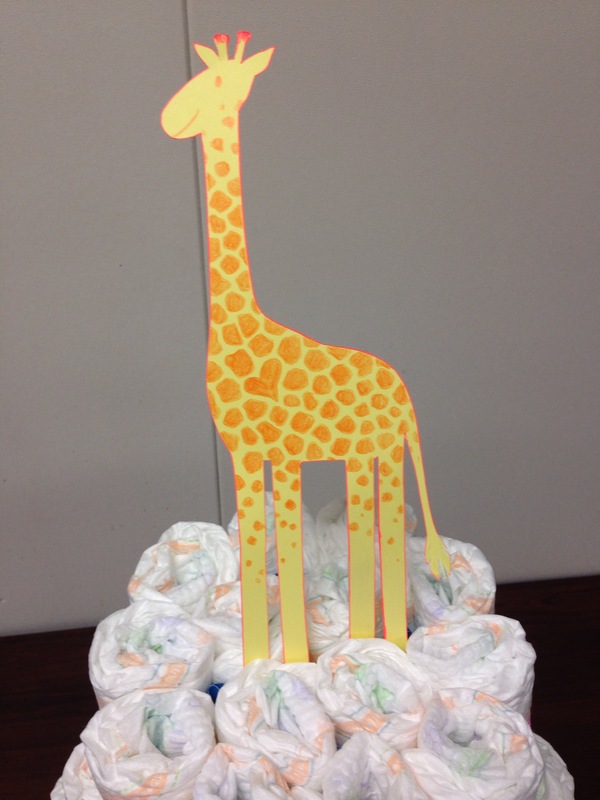 Step 3: Find something to keep the diaper rolled up! I’ve seen a couple done with rubber bands which, granted, can save you a ton of time, but as always I like using what’s already around the house, so I used colored thread. I wrapped the thread around twice for security and bowed it (NOT double knotted) so they can easily pull the thread off to unroll the diaper. Step 4: Make your first cake layer. I expected this to be a bigger cake, so I created my top layer with 4 diapers in the middle and 10 diapers surrounding it. Make appropriate adjustments based on how many diapers you’re working with and how many cake layers you’d like. Step 5: Secure the layer. I used curling ribbon. To keep a cleaner look, instead of tying it I overlapped the ends and secured it with tape. Step 6: Make the rest of your layers! Step 7: Create your base. I cut a cardboard circle out of the diaper box. Luckily the size the diaper box allowed me the perfect size base for my cake. Put your largest cake layer on top of the cardboard to trace how big of a circle you need. & then if you prefer to have the base not show like I did, cut it slightly inside of your trace. You can also buy a thick styrofoam base from your local craft stores to act as yet another layer of your cake and you can decorate as you please. Step 8: Secure the cake. Again, always using just what I have already at home, I created dowels out of thick construction paper. I taped two sheets together to make sure it was the appropriate length for the cake (just slightly shorter than the height of the cake), cut them into four strips, and then rolled each one up. You can use other dowels (wood, etc) for more stability if you choose. CAREFULLY, stick the dowels through each layer making sure you’re placing them in between the diapers and not through the diapers.